2016 has been a busy year already for Monde Sitole, and considerable press coverage continues to shed light on the various projects he is involved in, and the positive and empowering message that he is trying to spread. Most recently, Sitole was featured on the prestigious annual Mail and Guardian list of 200 Young South Africans for 2016. You can read the Mail and Guardian’s profile on Sitole here. In June, Sitole’s forthcoming Kilimanjaro trek was featured in The Times. 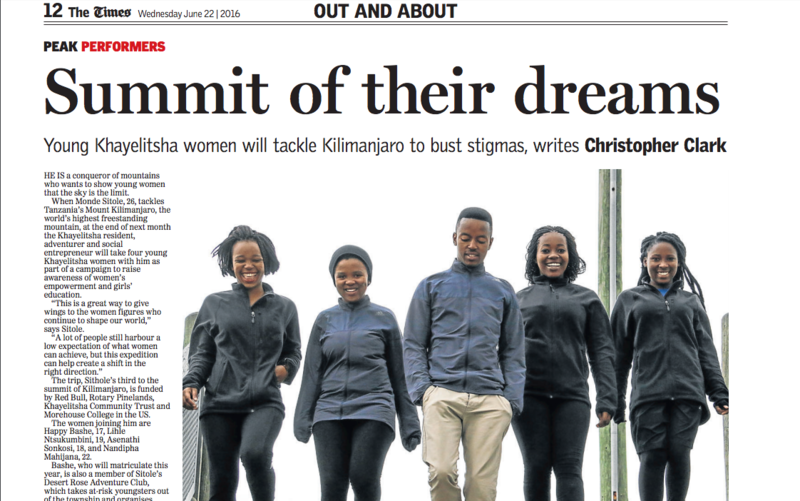 This is Sitole’s third time summiting the mountain, and this time around he will be taking four young women from Khayelitsha with him to raise awareness about women empowerment and girl chile education. Read the article here. Keep watching this space for more press coverage on Sitole’s work and projects. There will be plenty more to come.